There is a softness to the man’s eyes, a gentleness that belies his fierce devotion to honesty in business. His mouth rests in a slight smile, as if at his young age he has no worries at all. That man, William Henry Donner, possessed one of the sharpest business minds of the early 1900s. So, who was this man, the man who nearly single-handedly took some rocky land next to the Monongahela River and brought into being an entire town that supplied steel for the Golden Gate Bridge and nails, steel rods, and wire fencing used throughout the nation? Born on May 21, 1864, to a German father and British mother, Donner grew up in heady times for the nation. The Civil War had been going on for more than four years and wouldn’t end for another year, when Lee surrendered to Grant at the Appomattox Courthouse in Virginia on April 9, 1965. Donner’s family made their home in Columbus, Ohio, in a modest brick house in what is now the Topiary Park area, where Donner lived until he moved to Monessen at age 33. Donner left high school before the end of his junior year to work at his father’s flour mill, which had just lost its supervisor. Donner learned how to judge the quality of wheat and, more important, how to buy and sell it. The flour mill served as Donner’s apprenticeship, and he proved an astute young businessman. When Donner learned that his competitor was in fact not adhering to those prices, he became infuriated. “I had been stupid, and my pride had been hurt.” He immediately slashed his prices and began telling grocers and bakers in the city that his competitor had been fleecing them. Then he confronted the competitor himself. “Since you have given private rebates,” Donner scolded, “I want you to understand that we intend to sell fifty percent of the flour sold in Columbus and will continue [to offer] low prices until we secure that percentage.” The competitor fumed but eventually brought his prices in line with Donner’s, and within a few months Donner’s mill was serving about half the Columbus market, just as he had promised. 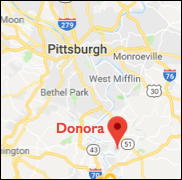 Donner’s drive for fairness, coupled with his knack for mathematics, came in handy when he built a tin mill in Monessen in 1897 and, later, steel, wire, and zinc mills in Donora, which he built and managed under the guidance of Andrew Mellon. He studied the area deeply, built lasting relationships with landowners, hired like-minded contractors to construct the mills as well as homes for the workers, and always sought to pay a fair price for good work. The mills, eventually bought by U.S. Steel, became a successful and profitable operation, providing steel and wire for the nation’s growing infrastructure. Donner never forgot where he came from, that unassuming brick house in Columbus, and in later life became an active philanthropist. After losing a son to lung cancer in 1929 Donner created the International Cancer Research Foundation, which morphed into the William H. Donner Foundation and continues to provide grants and support for a number of human rights organizations. He was also an important benefactor for his college alma mater, Hanover College, and was founder of the Donner Canadian Foundation, which focuses on public policy initiatives. The foundation each year awards the Donner Prize for the best book on pubic policy by a Canadian. Donner died in Montreal on November 3, 1953, at age 90, with that gentle smile still intact.